I’m starting to think everyone in Florida is smarter than I am. 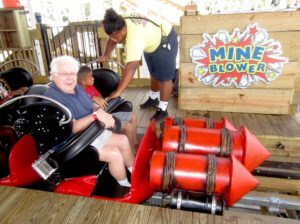 I’m still having vivid flashbacks to last summer, mid-July, when I went to Orlando to ride the new Mine Blower wooden roller coaster at Fun Spot America in Kissimmee. 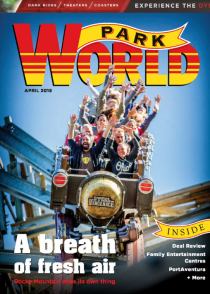 Mine Blower was the park’s new $6 million wooden roller coaster from The Gravity Group. 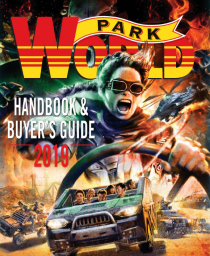 It was the first permanent thrill ride built at the park since Fun Spot purchased the property in 2004 and follows the success of White Lightning, a coaster built at Fun Spot America’s Orlando location in 2013 by Great Coasters International. This was The Gravity Group’s first coaster built in Florida, and with faux dynamite rockets mounted on each train, it’s explosive. Mine Blower sits atop steel angle iron supports, measuring 2,289 feet (698 m) long with an 83 foot (25.3 m) tall lift hill and a first drop of 81.5 feet (25 m). Riders experience a top speed of 49 mph (79 kph) before twisting through a maximum bank angle of 115° and a 360° barrel roll inversion above the loading platform. They are lifted off their seats 11 times. It is the only wooden roller coaster in the southeast United States that features a 360° barrel roll. So I climbed aboard Mine Blower, pictured here, with the three faux red dynamite rockets fastened in front of me. It made me think I was experiencing America’s pacifistic national anthem, the part about “…the rockets’ red glare, the bombs bursting in air…” Sitting behind the rockets, it turns out, was hot. Actually, sitting anywhere was hot. It was 98° (37° C) with high humidity. I was riding Mine Blower because I was doing a story about it. Why anyone else was riding in that heat is difficult to understand. Usually I ride a coaster to enjoy the cool breeze through my hair. But on this ride all I felt was a hot wind blowing perspiration into my eyes, and the sun frying the suntan lotion on my arms. It turns out most visitors to Florida weren’t in an amusement park, at least most smart visitors. They were in one of the many waterparks in and around Orlando. Universal’s new Volcano Bay waterpark was filled with guests. They were filled to capacity, so late arrivals could not enter. Likewise, Aquatica at SeaWorld Orlando. They were filled, too, as were Walt Disney World’s two waterparks, Typhoon Lagoon and Blizzard Beach. Me, I thought I should ride the roller coaster, right in the middle of the day as the temperature soared. It wasn’t my best idea, not smart at all. But eventually I came to my senses. This is why God invented air conditioning. I climbed back into my automobile, turned on the cool air, and drove back to the hotel. Here I put on my bathing suit and headed directly to the hotel’s outdoor swimming pool. Finally, some relief from the heat, but even the pool’s water was warmer than expected. Don’t get me wrong. I’ll return to Florida. But not in the summer. In the autumn, winter, or spring, it’s a great place to visit. Just not in the middle of July.